A few months back, I had written an article Getting Started with Process Builder – Part 17 (Auto Delete System Generated Chatter Post) to discuss a way through which, we can auto delete system generated Chatter posts. This article goes a step ahead and explains, how to auto delete posts generated from Quick Actions for objects in which Feed Tracking in not enabled. First of all, I would like to say thanks to Mr. Chris Whitehead for asking such a great question on Success Community. They want to auto delete post generated from Quick Action. Make sure that you have turned off Feed tracking for Time Sheet object. Also, remove Quick_Action__c field from the page layout. 8. Save your Flow with name Delete Quick action feed and close the canvas. Don’t forget to Activate the Flow. 2) Wait a few seconds and then reload the account page. Vigne Kozacek is working as System administrator at Universal Containers (UC). They normally grant read access to account records to account team members. He received a requirement to develop an application, that will allow all users (it should also work in case if they have only read access to account record) to add Chatter followers to the account record without editing it. There are few solutions possible for the above business scenario. We will use Flow and Process Builder (because it runs in system mode) to solve the above business requirement. 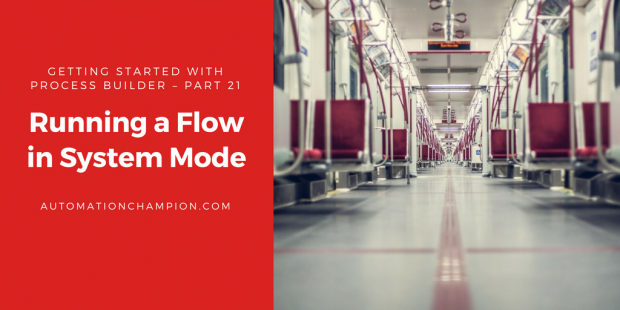 Before proceeding ahead, you have to understand User mode and System mode in Salesforce. System mode: – In which the object and field-level permissions of the current user are ignored. User mode: – In which the permissions, field-level security, and sharing rules of the current user are enforced. Flow runs in user mode. Process Builder runs in system mode. When you launch a Flow using the Process Builder, then it will run in system mode. Make sure that you have granted Read, Create and Delete access on the custom object to all profiles. 15. Save your Flow with name Add follower to record (Type: – Autolaunched Flow) and close the canvas. Don’t forget to Activate the Flow. 1) In this demo, I am going to use Demo User account (Profile assigned: – Standard User Clone, this user only has Read access on the Account and Read, Create and Delete access on custom object Add_Follower__c ). 2) The next step is to click on Add Follower button and follow the instructions available on Flow screen. Finally checkout the Follower section available on the record detail page.